Spook. Usually it means a ghost, but in this book it means an exorcist - someone who searchesout evil,and binds it, so that the ordinary people can live in peace, unmolested. 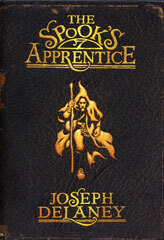 Can you imagine being an apprentice exorcist? It's a lonely and frightening job. Take Thomas Ward, for instance. He travels the county with his Master, in all weathers, with only a little to eat. When they reach their destination, there's a terrifying job waiting to be done. A ghast perhaps, boggart or witch to silence. And when the task is finished, and Thomas can go back to the Spook's house to rest withouthaving to lookover his shoulder, he has no friends, because who will befriend a boy whomingles with evil every day? She was probably about my own age - if anything slightly younger. Her face was nice enough, for she had large brown eyes, high cheekbones and long black hair. She wore a black dress tied tightly at the waist with a piece of white string. But as I took all this in, I suddenly noticed something that troubled me. The girl was wearing pointy shoes, and immediately I remembered the Spook's warning. 'A promise?' I asked, wondering what she meant. Well, he's just an apprentice spook, otherwiseThomas Wardmight haveknown to be a little more on his guard when dealing with strangers. But a promise is a promise and once given must be honoured. Brilliant. I loved the degrees of evil in this book. Some evil is manageable. Some isn't. You have to learn to trust your own judgment.